Does it have any added sweeteners in it? Does it taste like watered down koolade? One of the things I love the most about blogging is the opportunity to learn about new things. When Collective Bias asked me to try Genesis Today's superfruit juices, I was jumped at the chance. I had read a little about the antioxidant qualities of superfruit berries like Acai and Goji but I had never really tried them. Our whole family loved them immediately. Bob liked the Acai Berry, Roo prefers the Goji Berry and I like to mix Resveratrol and Acai Berry. Jasper likes all three of them, heavily diluted. 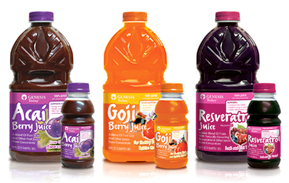 We liked them so much, we have kept all three Genesis Today juice blends in the fridge ever since. Being introduced to new consumer products is nice but sometimes a simple product review can lead to a new perspective. Learning more about Genesis Today and its founder, Dr. Lindsey Duncan- renowned naturopath and nutritionist, has made me even more interested in the brand. I am so curious to find out how a company that has been built upon bringing holistic health to the world has come to be found in the refrigerated section of Walmarts throughout the country. It bodes well not only for the brand's sales but also for the big box store's initiative into forging a healthier population. Collective Bias has asked several members, including me, to visit Genesis Today's headquarters in Austin (where I went to college back in the dark ages) for a behind-the-scenes tour and to hear the finalists in the Genesis of a Great Idea social media contest. We'll be helping to select the $10,000 grand prize winner! As if that wasn't exciting enough, we will also have the rare opportunity to pick Dr. Lindsey Duncan's brain. I plan on asking him about nutrition and thyroid disease, since that's something I've been dealing with since Roo was born and traditional medicine has not been particularly helpful in balancing my weight or mood. What about you? Do you have any burning questions for Dr. Lindsey Duncan? It's not every day you have access to such an authority on nutritional supplements and natural health! 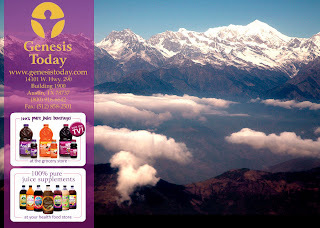 To enter and win coupons good for a free bottle of each Genesis Today juice, please comment on this post with the question you would like to ask Dr. Lindsey Duncan. It could be about their juices or natural health, in general. I will try to relay your questions to him while I'm down in Austin and post the answers next month. Entries will be accepted through Jan 25th and I'll pick the winner using Random.org. US readers are eligible. P.S. you still have time to vote for my Twitter page design for Genesis Today! Isn't it pretty? There are so many people dealing with anxiety problems and all the complications from that,such as back pain,chills,headaches,heart problems etc, and also all the add and adhd.I would love to probe the brain about this and what if any help they could offer on this problem..
have fun with your trip! I know that fruits and berries are high in nutrients and antioxidants, but what about their fructose content? Much of what I've read lately has discouraged consumption of fruit juice because of the high natural sugar content. Overweight people and diabetics are advised against fruit in all its forms. Can you provide some perspective, and perhaps advice on how best to incorporate fruit and fruit juices in a healthful diet? Already follow your blog on GFC. Already following you on Twitter as TantaDesChiens. You've been FAVED on Technorati by wandapanda. I'm a follower via Google connect! mhsteendream at yahoo dot com. Already subscribed to your blog via email. Ohh! I would ask about my ulcers. I have been trying cabbage juices, and was wondering if anything else, natural, helps heal the esophagus and upper gi. I am so excited that you are coming to Austin with us!! I'm really looking forward to trying the juice. I hope a local supermarket carries it here in Texas! Are vitamins really necessary with today's vast food choices, compared to, say, 100 years ago?